We’d love your help. 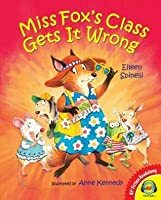 Let us know what’s wrong with this preview of Miss Fox's Class Gets it Wrong by Eileen Spinelli. To ask other readers questions about Miss Fox's Class Gets it Wrong, please sign up. Ever since Officer Blue Fox came to visit Miss Fox's class, rumors have started! Bear saw Officer Blue Fox stop Miss Fox on her bike; she must have done something wrong! The students start to see Miss Fox around town doing strange things like getting a disguise of a big hat and sunglasses. When they find evidence that she is leaving town they all conclude she is going to jail and needs to escape! Do the children have it right or are they guilty of spreading too much gossip? Why I liked this book Ever since Officer Blue Fox came to visit Miss Fox's class, rumors have started! Bear saw Officer Blue Fox stop Miss Fox on her bike; she must have done something wrong! 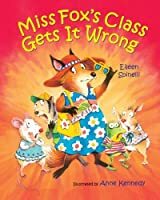 The students start to see Miss Fox around town doing strange things like getting a disguise of a big hat and sunglasses. When they find evidence that she is leaving town they all conclude she is going to jail and needs to escape! Do the children have it right or are they guilty of spreading too much gossip? Why I liked this book - I love the message of this book and it is a good one to teach. It is so important not to start rumors and not to gossip about people. Gossip is a kind of bullying and I think that maybe some kids don't understand that. I also love the way Mrs. Spinelli tells stories. She has a very important message in this book, but it is mixed with a lot of humor and it is told in a very kid-friendly way. I also like the funny illustrations (especially all the shocked looks on Miss Fox's student's faces! I think teachers could use this book in their classrooms to teach their students about how gossip can be harmful. I think kids 5+ will enjoy like LOVE this book! This is the perfect book to teach children that things are not always as they seem. And that even if there is a ton of evidence that supports a theory, that does not mean that the theory is true. If you like pairing books with aromatherapy as much as I do, I think the perfect combination for the book would be diffusing a few drops of doTERRA's clary sage and a few drops of lemongrass. But are great for opening the mind to consider other possibilities. **Talking points - Have you ever been misjudge This is the perfect book to teach children that things are not always as they seem. And that even if there is a ton of evidence that supports a theory, that does not mean that the theory is true. Students in Miss Fox's class misunderstood that Miss Fox would be in jail because they witnessed her with Officer Blue frequently. Students assumed that police officer is used to catch a person who commits a crime, so Miss Fox must violate laws and be with Officer Blue. It turned out that she was getting married to him. The lesson of the story could be summarized by the statement of Miss Fox that “Make sure you have all the facts straight before you start telling stories about others” (unpaged Students in Miss Fox's class misunderstood that Miss Fox would be in jail because they witnessed her with Officer Blue frequently. Students assumed that police officer is used to catch a person who commits a crime, so Miss Fox must violate laws and be with Officer Blue. It turned out that she was getting married to him. 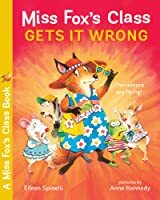 The lesson of the story could be summarized by the statement of Miss Fox that “Make sure you have all the facts straight before you start telling stories about others” (unpaged). Rumors or gossips would spread out quickly and cause serious misconception. This can allow children to think about the power of words and responsibility regarding what they are saying. Illustrations are not exquisite, but cute enough to attract child readers’ attention. Cute book. Teaches a nice lesson about rumours and gossip. This review has been hidden because it contains spoilers. To view it, click here. This book is not only a great lesson about gossip, it is absolutely adorable in illustrations and ending. I recognized Eileen Spinelli's name from her frequent contributions to Highlights magazine, which my mother subscribed to when I was a child. I have always enjoyed Spinelli's writing style because it is simple enough to appeal to kids without sounding stilted or choppy. The story was fast-paced and humorous, and Anne Kennedy's illustrations capture the mood perfectly. The shocked looks on the This book is not only a great lesson about gossip, it is absolutely adorable in illustrations and ending. I recognized Eileen Spinelli's name from her frequent contributions to Highlights magazine, which my mother subscribed to when I was a child. I have always enjoyed Spinelli's writing style because it is simple enough to appeal to kids without sounding stilted or choppy. The story was fast-paced and humorous, and Anne Kennedy's illustrations capture the mood perfectly. The shocked looks on the kids' faces are especially funny. 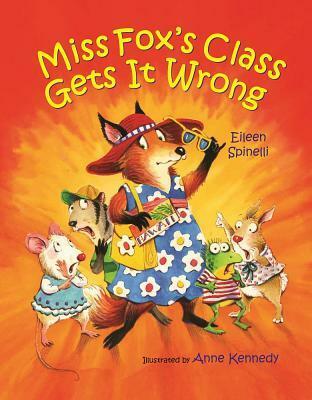 This is an entertaining story in the Miss Fox's Class series of books by Eileen Spinelli. The story helps children understand the consequences of gossip and rumor and how inaccurate they can be. The narrative is short and fun to read aloud and the illustrations are colorful and cartoonish. We enjoyed reading this book together. This book is full of humor and excitement. It would be very useful in teaching lessons of rumors and gossip. This book is a great lesson in rumors and gossip. Jumping to the wrong conclusions. Neel did not like it because Miss Fox went to jail.